delight by design: taking it outside! While letting myself dream about the next version of my bedroom it was hard to not ponder other spaces that warrant a little bit of my creative attention. The outdoor areas of homes are so often ignored or minimally furnished. When the weather is nice enough to enjoy your outdoor spaces you shouldn't waste a second of that time wishing that you had thoughtfully finished your patio. 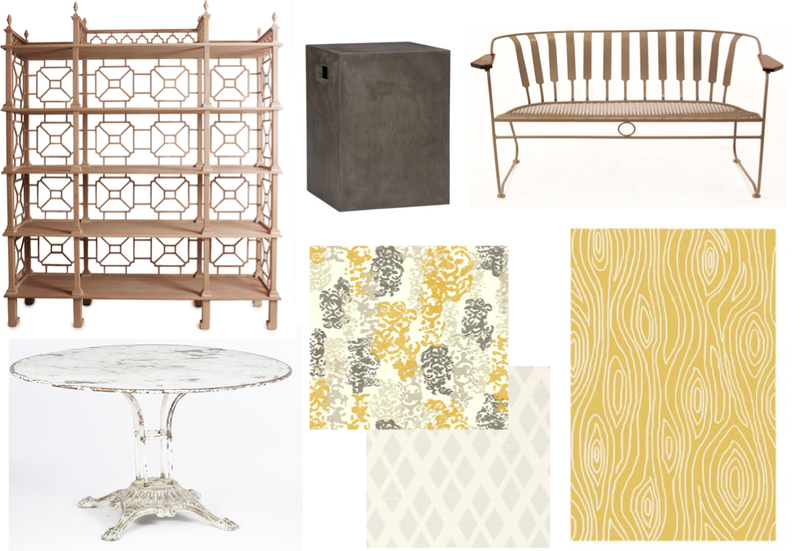 In preparation for the warm summer months to come, these are the pieces I would invest in for my patio! In all seriousness who wouldn't want to have a drop dead gorgeous teak outdoor etagere!?! You can also check out my favorite outdoor fabric selections, outdoor entertaining essentials and outdoor case pieces in my guest post on Chicago Home + Garden's blog, Design Dose! That cb2 side table is so pretty. Great find. Oh, it's all so gorgeous! Just wish I had a patio to recreate this look. I really love that outdoor bench. Such a pretty color and simple style. You could pair so many things with it. I love that hand carved teak etagere in the upper left hand corner. Oh my goodness, I could see books and dainty potted plants all over that beautiful piece~! Nice to see this pattern and that's outfit is also nice .